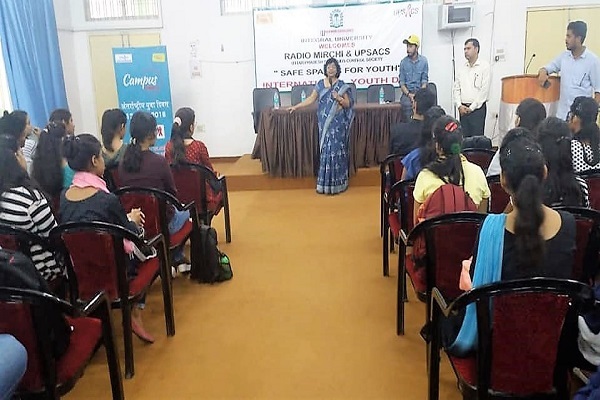 This International Youth Day, Radio Mirchi & UPSACS collaborated with Integralites and enhanced the concept of Safe Spaces for Youth. There are currently 1.8 billion young people between the ages of 10 and 24 in the world. This is the largest youth population ever. (1) These young minds are both the strength and responsibility of the nation. Every year 12 August serves an annual celebration worldwide day of the role of young women and men as essential partners in change, and an opportunity to raise awareness of challenges and problems facing the world’s youth. The date was first designated International Youth Day by the UN General Assembly in 1999. The theme - “Safe Spaces for Youth” Youth need safe spaces where they can come together, engage in activities related to their diverse needs and interests, participate in decision making processes and freely express themselves. While there are many types of spaces, safe spaces ensure the dignity and safety of youth. Safe spaces such as civic spaces enable youth to engage in governance issues; public spaces afford youth the opportunity to participate in sports and other leisure activities in the community; digital spaces help youth interact virtually across borders with everyone; and well planned physical spaces can help accommodate the needs of diverse youth especially those vulnerable to marginalization or violence, as mentioned on the United Nations website. Integral University, Lucknow hosted an intriguing program this August, on the Youth Day. The event was to celebrate the power of the Youth and to make this generation healthy promoting the Do’s and Don’ts. The program spread the much needed awareness about Drug abuse and AIDS, two most common but least discussed topics. The purpose of the event was to make the students believe that no one else can empower and enlighten the youngsters than the youngsters themselves and the best way to get answers to all questions is to ask questions freely. An Open interaction between the panelists and the students was initiated by Rj Vipul from Radio Mirchi and the session was a big hit with the students. Dr Geeta Agrawal ,Joint Director-Blood Safety & Secretary State Blood Transfusion Council was present on the occasion to brief Integralites on their responsibilities and solutions on the many doubts they may have at this age. The increasing vulnerability of the general population calls for a well coordinated national effort in order to contain health issues like Aids from spreading it further. “I am here so that these creative smart kids can come up to me to ask me anything about the topic that bothers them and needs clear explanation” said Dr Geeta. Uttar Pradesh Aids Control Society ( UPSACS) is extensively working towards making the juvenile safe and healthy. We know that the Young people have the power to change the world. This generation is the most interconnected generation ever, continues to grow rapidly, and the challenges they face are ever more daunting. While they surely have the capabilities to find the way out, Integral University believes that occasion like these where the young minds are rightly informed, open to ask questions and powered, makes their job easy and the world a better place for them to be in.